Type and Characteristics - Sloop of war, built at Navy Yard, Gosport, VA, launched 1844, commissioned 12 December 1844, 1,140 long tons, 163.5ft long x 32ft beam x 17.25ft draft, armed with 18-32pdrs, 186 crew, first commanded by Commander Robert B Cunningham. Log Period and Areas of Service - 1846-92, including African Squadron, Mediterranean Squadron, Brazil Squadron, Civil War, North Pacific Squadron, training ship. 25 June 1845 - Departed Hampton Roads as Flagship, Commodore Charles W Skinner, commanding USN ships off West Africa to suppress slave trade. Returned to Boston 6 August 1846. 28 March 1847 - Commanded by Captain Robert B Forbes, sailed from Boston with food for people of Ireland during the potato famine. Arrived Cork, Ireland to unload 12 April, and returned to Boston 17 May. 22 July 1847 - Departed Boston as flagship of Commodore W. C. Bolton for duties off West Africa. 1848 - Transferred to Mediterranean Squadron to protect US citizens during period of revolutionary movements in Europe. Returned to Norfolk, Va. 4 May 1850. 1 June 1852 - Departed Norfolk for duties with Brazil Squadron and operations off South America. Returned to Philadelphia Navy Yard 2 May 1854 and decommissioned 9 days later. 22 February 1855 - Recommissioned. Departed Key West 9 June as flagship of Commodore Crabbe with African Squadron, returned to Philadelphia 2 June 1857 and decommissioned. 16 December 1857 - Recommissioned, and served with Home Squadron in the West Indies. Decommissioned at Philadelphia 14 February 1860. 5 June 1861 - Recommissioned on outbreak of Civil War and served with the Atlantic Blockading Squadron. 5 August 1861 - Drove bark Alvorado ashore off Fernandina, Fla, and set her on fire. 31 August 1861 - Captured schooner Aigburth off coast of Florida. 4 September 1861 - Captured and scuttled schooner Col. Long. 15 December 1861 - Captured schooner Havelock. 1 May 1862 - Captured brig Intended off Wilmington. 12 October 1862 - Sailed for Pacific to protect Union shipping from Confederate privateers until end of war. Decommissioned at Mare Island 17 September 1865. 3 September 1866 - After converting to transport and store ship, recommissioned to serve at Panama as store and hospital ship. 2 April 1867 - Fever on board and ordered to San Francisco for disinfection. 11 September 1867 - Joined North Pacific Squadron as guard and storeship at Sitka, Alaska until 30 May 1868. Arrived at Mare Island 23 July 1868 and decommissioned 13 August. 18 October 1867 - Present at Sitka for hoisting of U.S. flag following purchase of Alaska from Russia. 25 January 1869 - Following repairs, recommissioned, and spent nearly three years in Pacific, cruising the coasts of North and South America and sailing to Tahiti, Fiji and Hawaiian Islands. Decommissioned 7 October 1871. 16 March 1876 - After nearly five years decommissioned in ordinary at Mare Island, recommissioned as State Public Marine School for service in Hawaiian Islands. Returned to Navy Department and decommissioned 3 March 1879. 8 May 1879 - Recommissioned and sailed for Sitka to survey harbour and protect US interests. 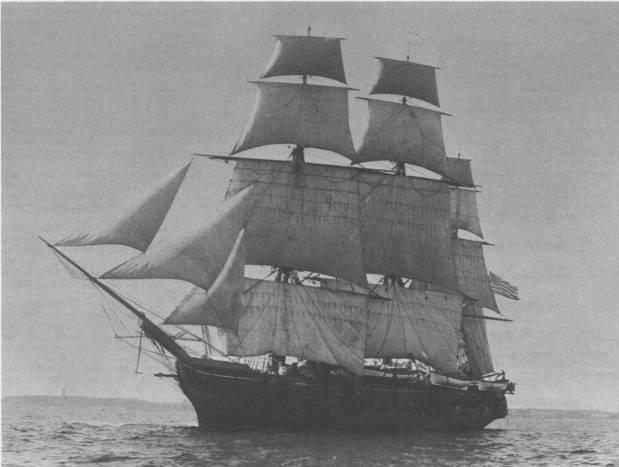 Sailed the Pacific in 1881 and decommissioned at San Francisco on 21 September 1881. 14 February 1882 - After fitting out as an apprentice training ship, recommissioned and headed for Atlantic coast via Cape Horn. Voyages included West Indies and Spain. Decommissioned at Norfolk 31 August 1888. 13 April 1889 - Recommissioned as apprentice training ship, and cruised to France and West Indies. Decommissioned again at Norfolk 6 September 1892. Fate: Transferred to Treasury Department on 9 September 1892 as Marine Quarantine Hospital in Hampton Roads. After being returned to Navy Department, destroyed by fire at Norfolk Navy Yard on 3 January 1913.